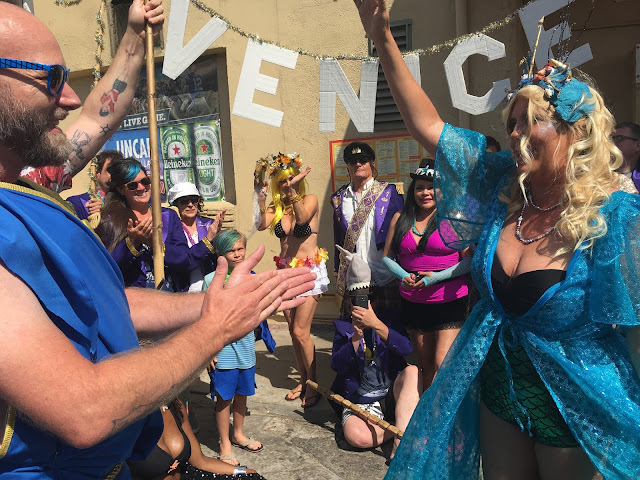 Blogtown: The 2017 Venice Neptune Parade - Hail Summer! Hail Venice! Hail Yes!!! The 2017 Venice Neptune Parade - Hail Summer! Hail Venice! Hail Yes!!! 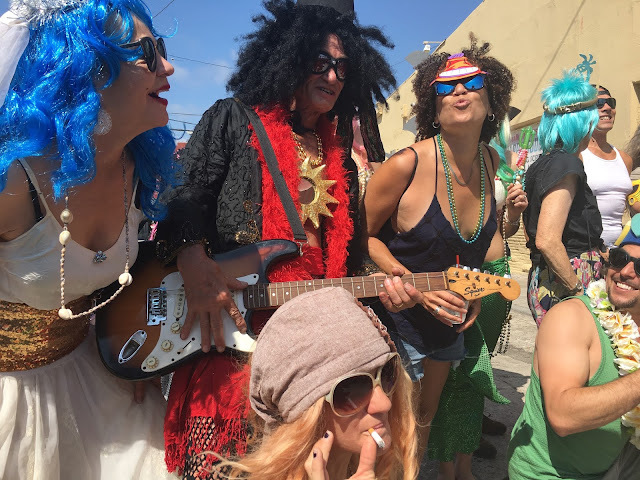 Last Saturday was just about the best Venice day ever. After the sadness of Abbot's Habit's closing party the night before, everyone was ready to have some fun, and remember what Venice is all about. It was June gloomy out, though, and many were dealing with the vicious hangovers that come with drowning deep sorrows like a local institution closing forever. We were going to have to dig deep to rally if we were going to officially declare it SUMMER in Venice at this year's Neptune Festival. So that's exactly what we did. I was deeply honored and humbled to be asked to be the Queen of this year's Neptune Fest, along with Jeremy Marco as King Neptune. 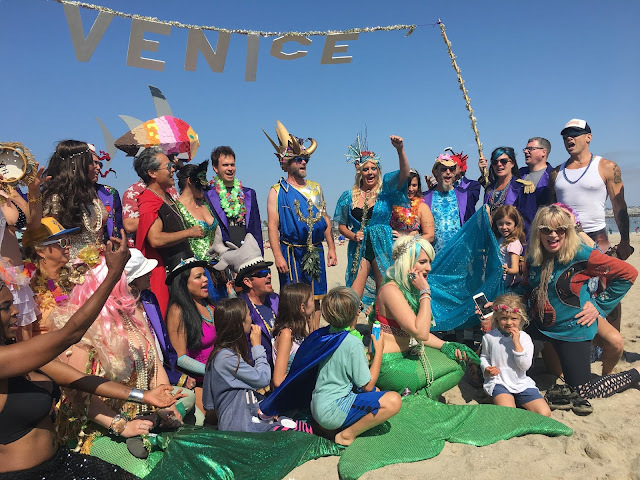 This has been a very heavy year for many, myself included, and the opportunity to ring in Summer in the name of Venice was just the bright spot I needed to look forward to - and it did not disappoint. My Mom - the Queen Mother - came in from Minnesota and created a royal robe fit for the Queen of the Mermaids. My dear friend Stephanie Hobgood came in from the Valley and gave me the mermaid hair of dreams. My dear friend Kimberly Jackson came in from Wabi Sabi (where she is the "Door Diva") to bedazzle my eyes with an enchanting mermaid sparkle glow for the occasion. 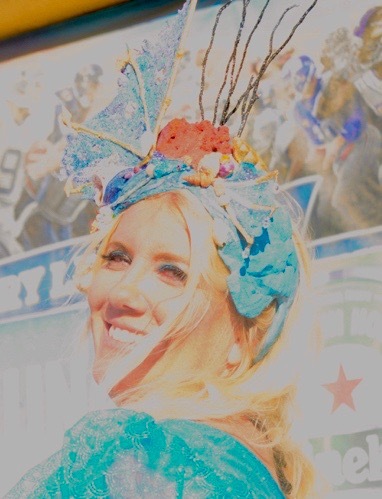 My dear friend Rebekah Ozier created a masterpiece of a Queen Neptune crown that was so spectacular I felt transformed the instant I put it on. It even had shells from our beach in Venice on it! It is truly Venice Historical Museum worthy. While we were busy getting me all dolled up for the parade, the sun began to ease its way out. By the time we left (very late!) for The Sidewalk Café for the pre-party, the skies had turned entirely blue, and the stage was set for our Summer Solstice Festival. We arrived to cheers and applause, and I was immediately given a shot that turned my personal tide for the much better. We took photos and marveled over the wonderful costumes that were showing up, and you could tell that we were all ready to blow off some steam. These events always take place on Venice Standard Time, which is to say it's not exactly "sharp". Ever. Think of it kind of like Island Time. A crowd was building up outside, as they had been told 3 p.m., and it was well past time to march down the Boardwalk. 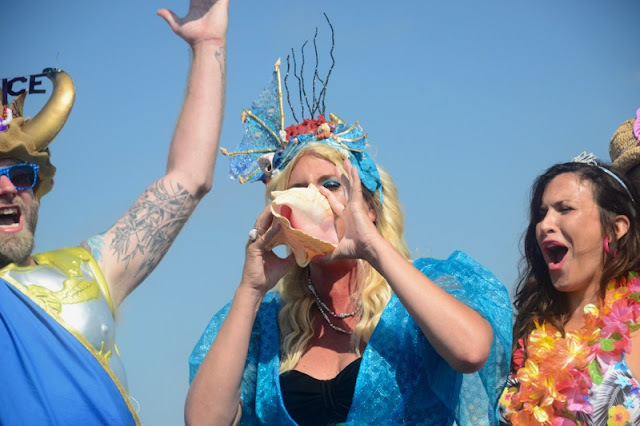 The royal conch shell was blown to rally the Merpeople, and we processed out of The Sidewalk Café. We were greeted by shouts from the crowd, and I almost cried to look around and see all the wonderful Venice faces from my past and present, there to join me in declaring it Summer - the very best time to be here in Venice. 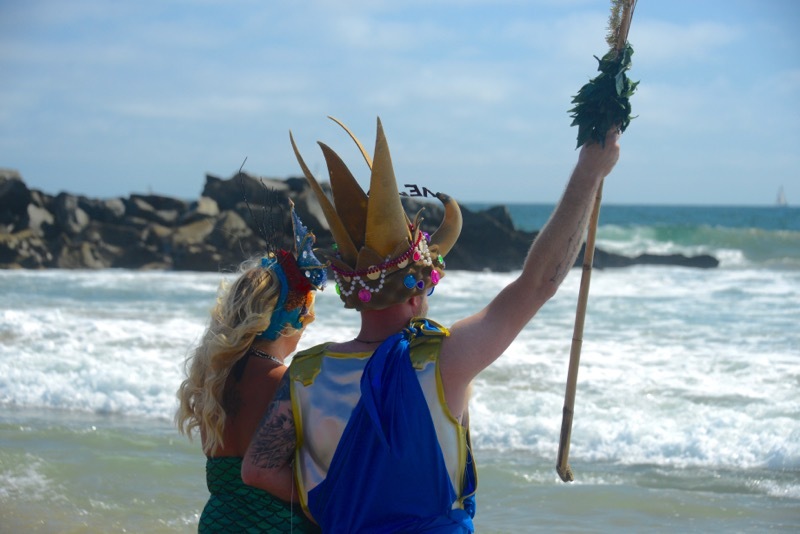 There was a brief ceremony to pass down the royal scepters from the previous King (Jeremy Parker) and Queen Neptune (Dakota Rayfield, filling in for Kaycee Smith, who was at Primus. I get it. ), where we humbly accepted our royal duties. It was important to me that my little kid friends would attend this year, because that is the way to keep traditions alive. Those little buddies having these awesome Venice memories will ensure that they want to carry them on when they grow up. The little boys and girls dressed up too, and jockeyed for position to carry a piece of the hem of my robe down the Boardwalk. It was precious, and they were probably the highlight of my entire day. Once about a zillion photos were taken, it was time to march to the sea! The Venice sign was unfurled over our heads, and King Jeremy and I led the parade on down the Boardwalk. The entire crew chanted the whole way to the water, yelling, "HAIL THE KING! HAIL THE QUEEN! HAIL VENICE! HAIL SUMMER! HAIL YEAH!" at the top of our lungs as we walked. Apologies to the street performers down there whose acts we interrupted, but you have to admit, it was a pretty awesome sight to behold. 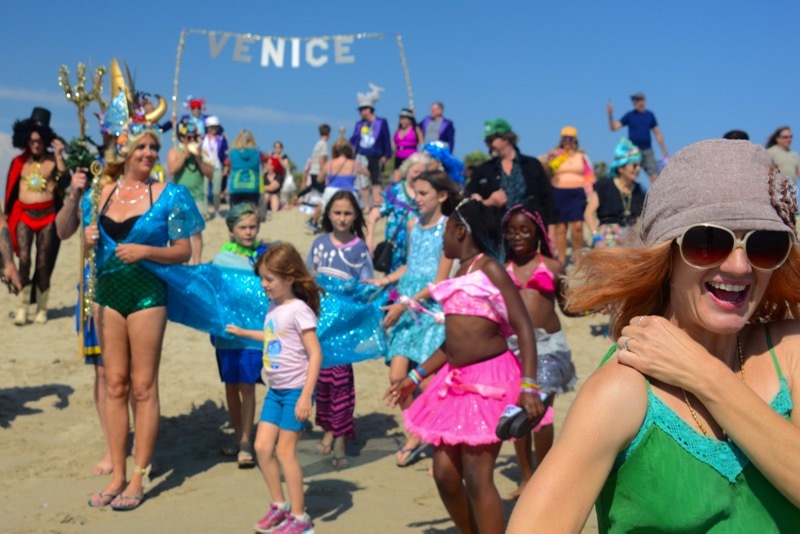 A whole town of friends and families marching together through the crowds at the beach, to show them what the Spirit of Venice means. The delighted faces we passed, the cameras being whipped out to capture it all, and the willingness to join in was the very best. 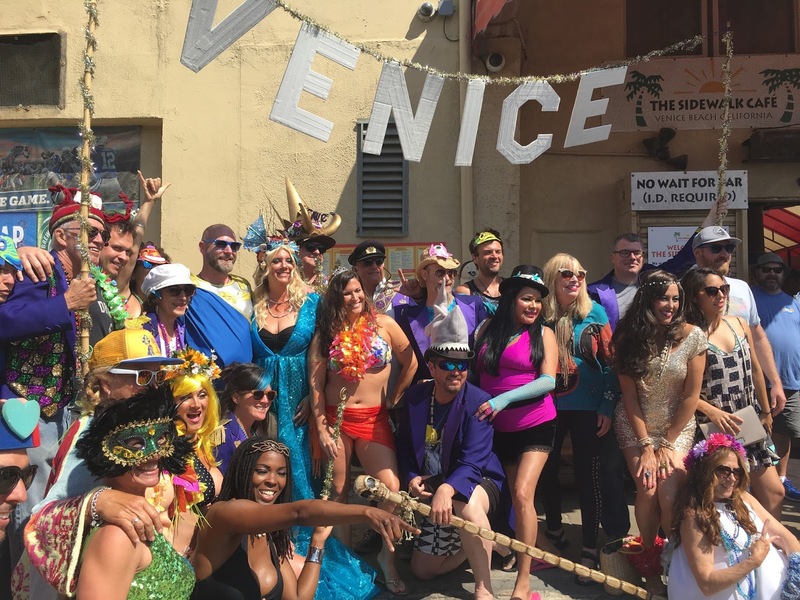 We stopped for more group photos, and all the colorful attire and surroundings made for some all-time great shots. It couldn't even be helped. 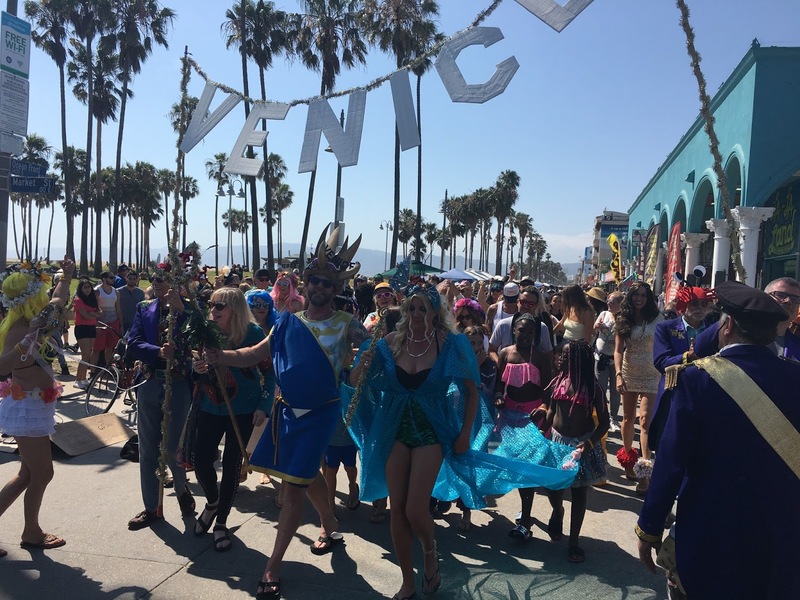 The parade carried on past the V statue, and on to the Venice Skatepark. Skaters joined in the chanting, and we exchanged the raised fists when it got to "HAIL VENICE!" As one should. Out across the sand we went, with the little kids picking up the chant at one point. You could tell they thought they were getting away with something a little naughty when they yelled "HAIL YEAH", and it was the most adorable thing ever to hear in their high little voices. I keep smiling every time I think about it. 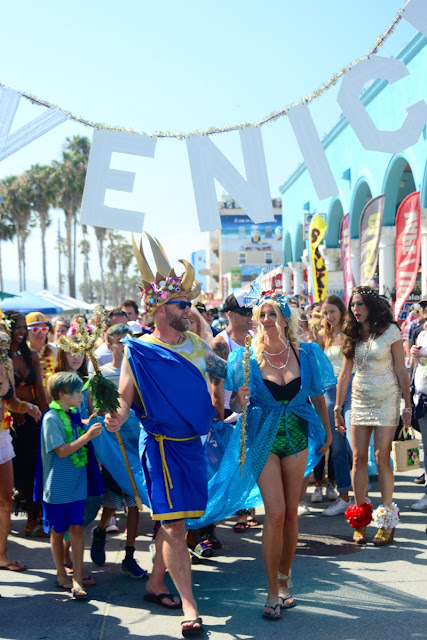 Once down by the Breakwater, it was time to disrobe and enter the sea to officially declare it SUMMER in Venice! 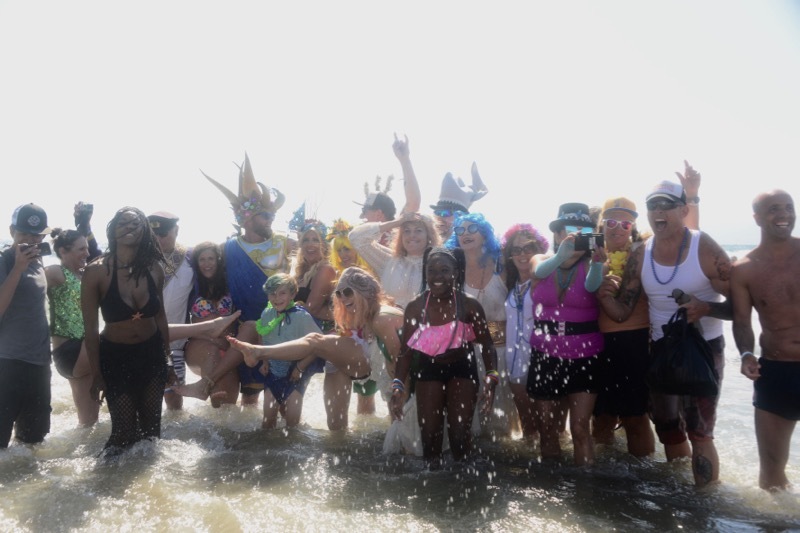 The water has warmed up quite a bit, so this part of the tradition was not at all torture. King Jeremy scooped me up, I raised the trident, and BAM! It was Summer!!! 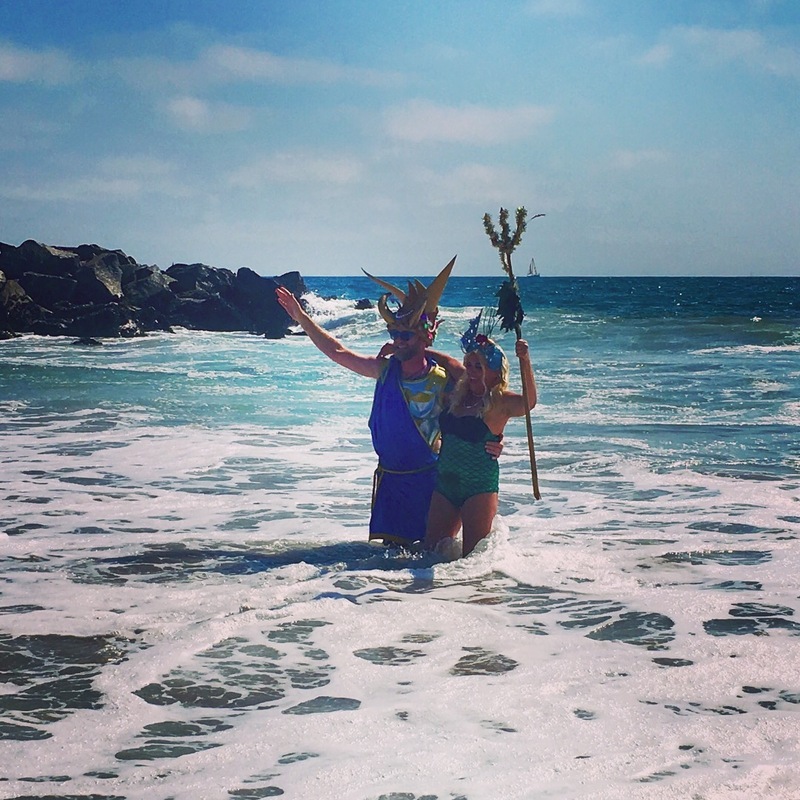 I encouraged everyone to join us in the water, and several gamers braved the waves with us, in the name of Neptune! We had a little bathing beauty photo shoot, and I couldn't stop beaming when I saw all the effort and creativity that had gone into the fine costumes of the day. 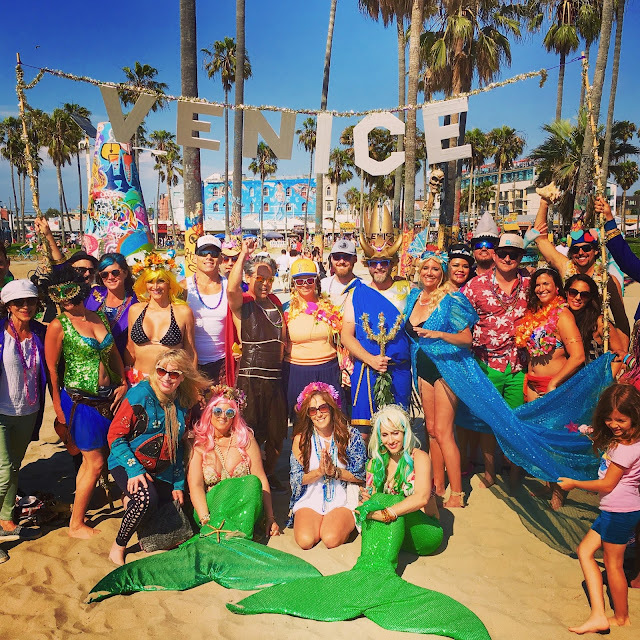 We even had real mermaids! Back on land, it was time for the official speeches and declaration of Summer. 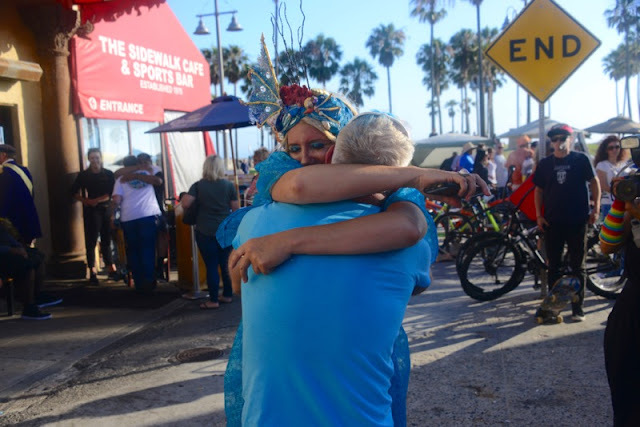 I barely remember what I said, but I know it was heartfelt and very difficult for me not to well up and start crying, both from the sheer happiness and joy of the day, but also the sadness that the Venice we know and love is becoming more unrecognizable every day. I know that I said that events like these - and the PARTICIPATION in them - are what will ensure a cool Venice for the future. I know that I said "We are all still here!" because I looked out and saw everyone I knew, and if I didn't know them yet, I wanted to. 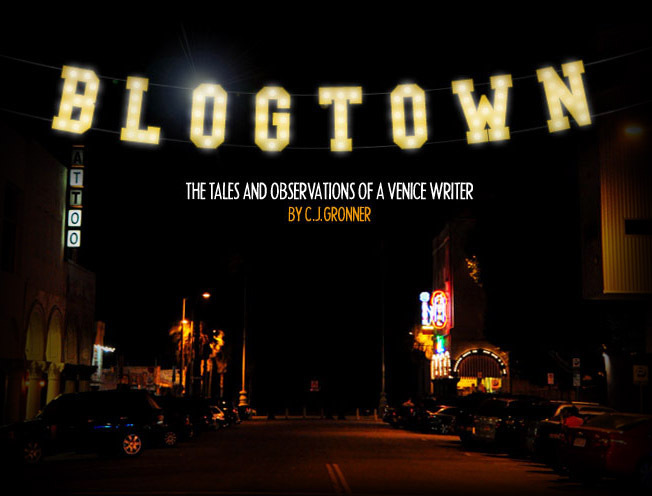 Because these are the very best parts of what we love about Venice. The FUN. The ART. The CREATIVITY. The SPONTANEITY. The COOL. The DIFFERENT. The MUSIC. The FRIENDSHIP. The LOVE. It's all I felt, all day long. Once I finished rambling on, King Jeremy took the official royal proclamation, and read it with gusto to make it all officially official. 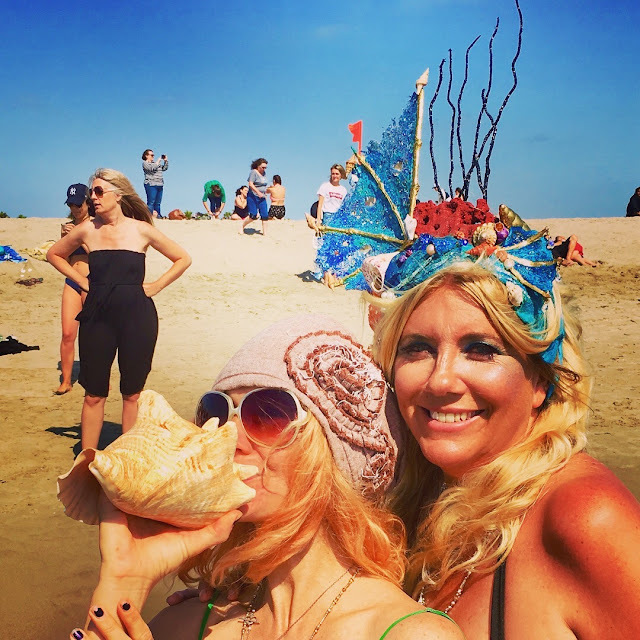 Once the words had been spoken, we both took the royal conch shell and blasted it to let all know, far and wide, that it was SUMMER IN VENICE!!! 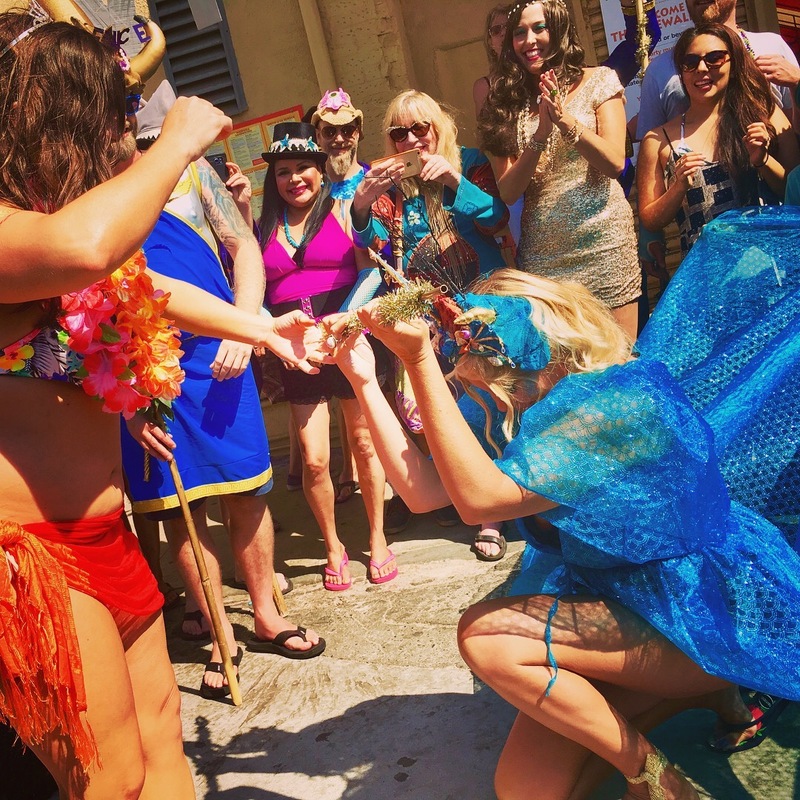 The cheering and chanting carried on all the way back to the Sidewalk (with brief pit stops to greet our subjects at The Townhouse and the new Surfside - formerly Danny's Deli - it looks nice). 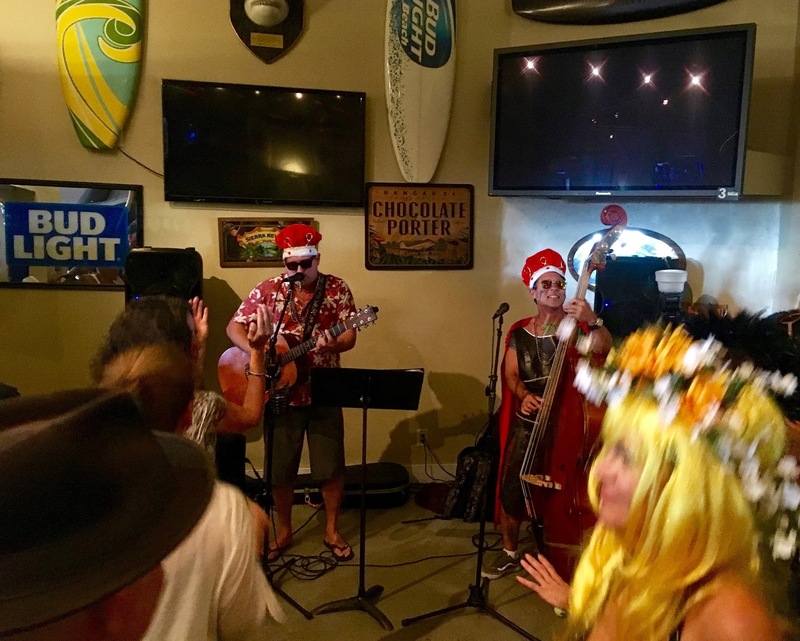 The group had re-assembled in the back of the bar in the Sidewalk, and were now being entertained by former kings Jeremy Parker and Masao Miyashiro, giving us their punk jams. It was just so fun. It was like a big, long photo shoot all day, and every one I've seen shows nothing but happy smiles all day. You really couldn't help it, there was just so much fun being had. The appreciation for Venice and its People was tangible all day long, and I can't get over that I got to lead it all this year. 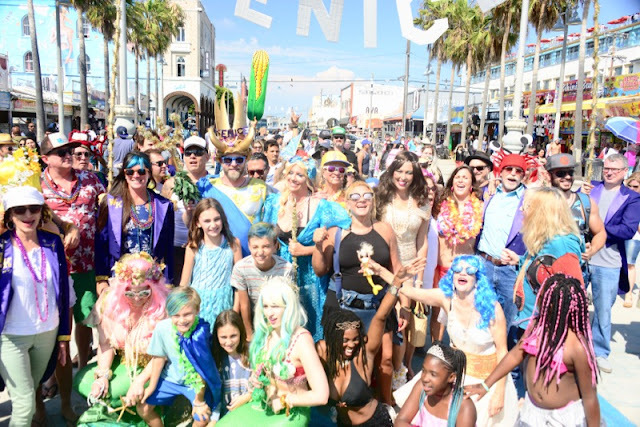 Eternal thanks to the Neptune Committee for choosing me to represent the fair citizens of Venice and Neptune this year! It will absolutely go down as one of my very favorite life memories, and I hope that goes the same for all who were there in attendance and solidarity. It was a classic day, and a classic weekend. 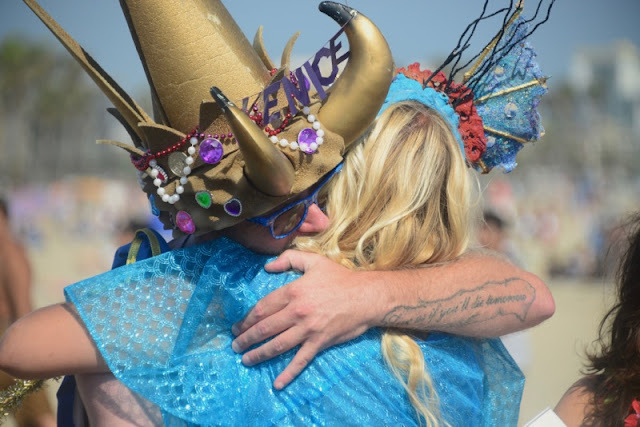 One that shows just how very powerful the spirit remains here in our beachside Community. Forever. You could just feel it. HAIL VENICE! HAIL SUMMER! HAIL YEAH!! !